It's not often that an Oriole wins the American League Player of the Month award, as Melvin Mora has done for his scalding month of May at the plate. Mora's .402 batting average, .480 on-base percentage, and .701 slugging percentage last month all led the league. For the season, he's at .377/.459/.598. He ranks first in the league in batting average and runs scored, and he's second in OBP, fourth in slugging, and ninth in RBI. Needless to say, those numbers represent a phenomenal level of production, comparable to what he accomplished in the first half of last year. Yet Mora is still not making much of an impact on the national radar. In the first month of All-Star voting, for example, he did not get enough votes to be listed among the top five AL third basemen, according to numbers released Tuesday by the Associated Press. As the reigning MVP, Alex Rodríguez should get the benefit of the doubt in the early voting, but Mora has out-hit all of his peers at the hot corner this year. Even after taking his fielding struggles into account, he is one of the top two or three third basemen in baseball right now. But a lot of people still view him as a flash in the pan, a guy playing above his head who will come back down sooner or later. Did Syd Thrift know that Mora had this ability when he acquired him from the Mets in 2000? Probably not. But Thrift, who lived up to his surname by nabbing usable players from baseball's scrap heap, perhaps was more astute than people thought. Lots of people snickered on July 31, 2000, when he said after completing the last of five trades, “Somebody is going to be able to sit up here three years from now and say how smart they are.” But last July, there was Mora in the All-Star Game as the Orioles' lone representative. And he's playing so well this year that there's no way Joe Torre could deny him a spot on this year's squad. Not that any other Thrift acquisitions look smart today. Of the fourteen players Thrift acquired in that flurry of deadline deals in 2000, Mora is the only one who evolved into a legitimate major-league starter, and José León (a sometime backup for Mora and first baseman Rafael Palmeiro) is the only other still in the organization (or the majors, for that matter). After a series of failures to rejuvenate the Birds in four years, Thrift was terminated after the 2002 season—before Mora's breakout year—and has since retired from the game. But if the supercharged Mora is the upside of Thrift's legacy to the organization, then people may view his tenure quite more favorably than before. Just as many doubted Thrift in 2000, some were skeptical when the Orioles' current front office of Jim Beattie and Mike Flanagan quietly signed Mora to a three-year, $10.5 million extension last winter and dubbed him the team's starting third baseman. Although he was eligible for salary arbitration before inking that contract, Mora was not a young, developing player entering his prime years like most arbitration candidates—he turned 32 in February. Moreover, he had never approached his 2003 production before, not even in the minor leagues; taking away his 2003 numbers, he had hit a weak .249/.334/.388 in the majors. Although he got off to a blistering start last year, he slumped conspicuously in the second half while suffering two serious injuries, first being hit on the hand in June and then tearing his medial collateral ligament in September. And he had not played third base with any regularity in the majors. Much of Mora's value supposedly was in his ability to play nearly everywhere on the field, so fixing him to one position would subtract versatility from his strengths. So far, only one of those misgivings has held any water. This season, Mora has had some trouble adjusting to the hot corner, making thirteen errors. But on the whole, Mora is making Flanagan and Beattie look like sages. 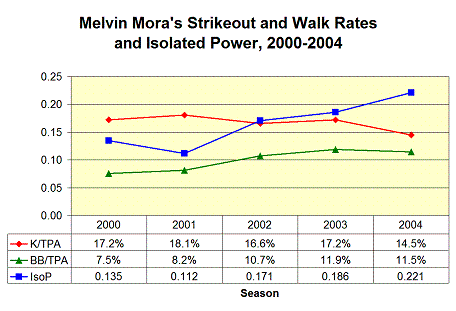 Note the sizable increases in walk rate and isolated power from 2001 to 2002. I wonder if Mora consciously changed his hitting approach after his wife gave birth to quintuplets back in 2001. Maybe he decided that to secure his family financially, he'd need to hit well enough to break the “utility” label and be seen as an everyday player. If he indeed made that determination, it was not immediately apparent, as his hitting statistics actually slipped between July 30, 2001, his first game after the quintuplets were born, and the end of the season. But since then, his improvement has been marked and sustained. And despite the added power, Mora is striking out no more than he did before. Such a late-career leap in production is rare, but not unprecedented. Luis González and Steve Finley come to mind as recent examples of hitters who surged after turning 30. But will it last? The weight of history would say not, that in general hitters peak in their late twenties and can be expected to decline after age 30. But González and Finley have been able to stay productive into their late thirties. And like that Diamondback duo, Mora was blessed with above-average speed and agility, so his performance is less likely to suffer the rapid deterioration that plagues less-athletic players with “old man's” skills (i.e., power and plate discipline). So he could conceivably age as well as they have. But it's hard to make confident generalizations about a class of players that is, after all, the exception to the rule. Is there Mora where that came from? I sure wouldn't mind having a sample of whatever magic pixie dust Melvin Mora is snorting, whatever fountain of youth he has discovered or freaky superpower he has been given. As long as it doesn't require having quintuplets. p.s. I'm still working on another analysis of the Orioles' player evaluation tendencies, which I hope to have ready by this weekend. This page contains a single entry from the blog posted on June 3, 2004 9:07 AM. The previous post in this blog was Taking swings at the Orioles' pitching staff. The next post in this blog is Inside the Orioles' heads, part 3.